I hope you all had a wonderful Christmas, and are enjoying the last few days of 2012 just before the New Year! Over the first few months of 2013 I'm aiming to shed a few pounds i have but on over Christmas, but i know after about a week a big mac or a chocolate cake will literally be screaming my name! Anyway, I have been nominated for the 'Versatile Blogger Award' by Elysia (littlebeautyblogg). I am incedibly grateful for this award and I can't thank her enough! 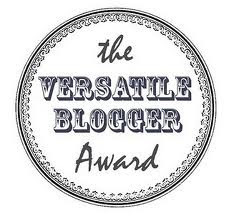 The Versatile Blogger Award is an award awarded to relatively new bloggers! The rules: 1) Nominate up to 15 fellow bloggers who are relatively new to blogging. 2) Let the nominated bloggers know that they have been nominated for this award. 3) Share 7 random facts about yourself. 4) Thank the blogger who has nominated you. 5) Add the Versatile Blogger Award picture to your post. 1) I am currently wearing a frog onesie which was a present from my Grandma, and although it is not the most glamorous outfit, it is so cosy! 3) I watched Love Actually about 9 times this Christmas. 4) I thought Jack in Titanic was Heath Ledger..
6) I love checking out blogs, so leave your link down below if you'd like me to check it out! 7) Thinking of 7 random facts about myself was actually harder that I thought! I'm not sure what that says about me! That's all of my nominations! Be sure to check out their blogs! Again, I can't thank Elysia enough for nominating me! Happy New Year to you all! Have a good one! 6 comments on "the versatile blogger award!"